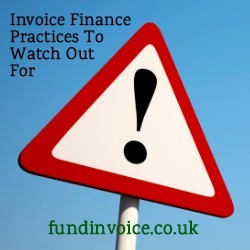 Whilst having a meeting with one of our funding partners, we started discussing practices that can mislead customers, that we have come across around the invoice finance industry. I thought it might be helpful to put up a list of these practices so that customers can watch out for them. I have posted before about the research we have conducted into the setting of minimum fees. Most of the whole turnover invoice finance companies will set a minimum monthly fee, however they tend to set them at about 75% of whatever turnover level they have based their pricing upon. However, in some cases, the minimum fee has been set a a figure that exceeds the expected service charge if the customer achieves their anticipated turnover. This means that they service charge percentage quoted may look low, but once the minimum bites, the amount charged will be higher. This is an example of how that works. If you were to be quoted say 0.5% on turnover of £1,000,000 per annum, that would be a service charge of £5,000. However, if the minimum monthly fee is then set at say £500 per month, that is a minimum of £6,000 per annum - equivalent to a service charge percentage of 0.6%. Clearly not the 0.5% your may have been expecting - in fact 20% higher. Two aspect of the discount charge were discussed. Firstly, the practice of quoting a daily rate of discount, which to the layman compares very well with an annual discount percentage. The example given was a customer that had been quoted 0.015% discount charge per day. When you annualise that, assuming they use 365 days per annum, that comes to just under 5.5%. The party that was providing the alternative quote were able to beat that discount charge, but on face value an annual discount fee of say 3% looks more expensive than 0.015% per day, even though it is significantly less. If you want to know how to work out the discount charge see the section "Calculating Discount Charge" in our guide to factoring. The second aspect of discount charge was that we had come across an example of a minimum base rate being charged. Several of those present recalled discussions with accountants that were not able to understand how the discount charge was being calculated due to a minimum base rate being applied. For example if base rate is say 0.75% with a margin of 2%, that is 2.75% per annum. On funds in use of say £100K, that would be £2,750 per annum (ex an applicable VAT). If there is a minimum base rate of say 3% being applied, that makes the total discount fee 5.75% per annum. Again on £100K funds in use, that would be £5,750 - way more than the previous value using the actual value for base rate. There were other practices discussed, such as differences in pricing according to previous deal underwritten (effectively discounting new prices), and variations in risk approach based on random factors such as location. All of these brought home the benefits of working with experienced brokers that understand these practices, and how to avoid them impacting the quote that you are seeking.